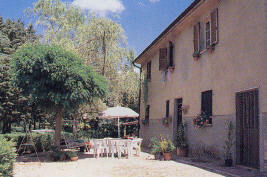 The guests can be lodged in a very nice detached little cottage surrounded by cultivated fields and called “ Ca’ di Giulia” and in a flat, called “Ca’ di Carla”, with independent entrance. This flat is situated in the owners’ house and it is suitable for handicapped people. The two farmhouses are completely restored but they still have the original structure and they are both furnished in a simple and comfortable rustic style. living room with a fireplace and double bed sofa, cooking corner with oven, toilette. Double bed room, twin bed room, bathroom with shower. Shady open space with equipped garden. Living room with a single bed sofa and cooking corner with oven, double bed room with another single bed, bathroom with shower. Private and equipped garden reserved to the guests of the flat. 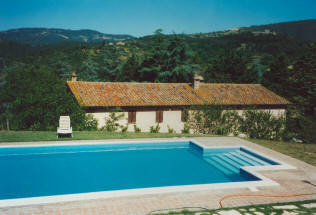 The swimming pool (12 × 6 metres) is situated in a panoramic position next to the owners’ house and it’s reserved to the guests, in this area there are modern garden furniture and solarium. The swimming pool is opened also in the night.